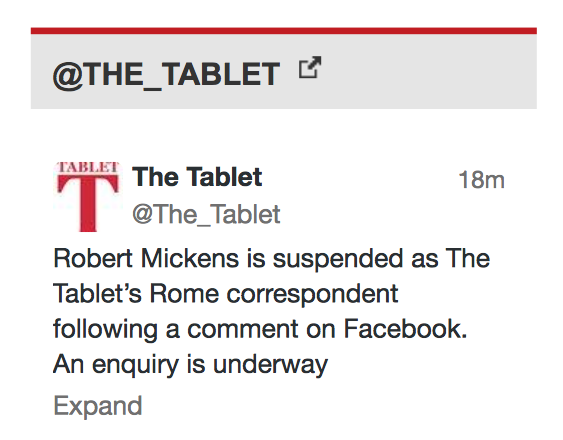 Robert Mickens is suspended by The Tablet! p.s. I think these two screen shots must be the most reproduced without attribution or acknowledgement in recent internet history! I have just stumbled across this Dutch site. Look under 'inventory'. Some will weep, others will rub their hands and reach for their credit cards. At any rate, if anyone wants to equip his church with Beautiful Things for Jesus (BTJs), he could do much worse than to start here. I haven't dared to ask the prices, though. Much better these things find a new home in churches than in bars. As you would expect, The Tablet has been hardly able to contain itself since the election of Pope Francis. Paeans of praise arise from their pages every week for this Joannes XXIII redivivus. There is a feeling of 'we thought it was all over for us, and now, from out of the blue, here come the cavalry!' Robert Mickens is particularly enthusiastic, and rarely does a week go by without him getting in at least one dig at the Pope Emeritus, usually by unfavourable comparison with the present Holy Father. Comparisons are odious, it is said, and his are particularly odious. When writing directly about the Holy Father, The Tablet says little about his more conservative utterances—as you would expect. There seems to be a sense that the Holy Father has to say these things because of the conservative people his two predecessors filled the Vatican with: he can't move too quickly. But we all know what he thinks really—he thinks like us! All we have to do is bide our time. So, The Tablet is quickly forming a consensus in its leaders and in its correspondence pages and in most of its articles (I make the noble exception of Christopher Howse whose articles are as excellent as ever). No doubt its purpose is to help the Holy Father form a picture of how the Church should look when he has done the thorough reform which he has embarked upon. • There will be appropriate respect for the person and office of the Holy Father. However local churches will make all serious decisions for themselves. • In this, there will be real participation by the laity who will have a say in every issue that concerns them. They will participate in the governance of the Church. • Worship will be liturgical and meaningful, and people-centred. Rites will be respected, but not regarded as shibboleths. • All seven sacraments will be administered to all who wish to receive them. • There will be no distinction between men and women, gay or straight, when it comes to deciding who may receive Holy Orders. • Clergy will be able freely to marry. • Remarriage in church after divorce will be available to all. • The Church will firmly stay out of the bedroom. • The use of artificial contraception will be judged to be both wholesome and responsible. • Homosexual unions will be respected and welcomed in a loving community as will all LGBT people and relationships. • While not supporting the practice, the Church will respect and lovingly support those who feel they have no option other than to have recourse to abortion or euthanasia. It seems to me that The Tablet may be trying to reinvent the wheel. This has all been already done, and if this form of Church appeals to them or anyone else, they might care to have a look at this movement, which will give them everything their hearts desire. [Link] You might even call it an Ordinariate in reverse. Clergy might like to click here. …quas in substantiam pretiosæ hujus lampadis apis mater eduxit. O vere et beata et mirabilis apis: cujus nec sexum masculi violant; fætus [?] non quassant, nec filii destruunt castitatem. Sicut sancta concepit virgo Maria, virgo peperit, et virgo permansit. The action of Michael Olson, the very new Bishop Olson of Fort Worth, a mere three weeks into his pontificate, in forbidding (or, more accurately, attempting to forbid) Fisher More College to celebrate Mass in the Extraordinary Form has been drawing a great deal of comment around the world. It seems to have been Rorate Cæli who broke the news, and they did so, understandably, in a tone of outrage. To summarise the goings-on for those who aren't up to speed; Fisher More College in Texas is a College of Tertiary Education of traditional stamp where the liturgy also is celebrated in the Extraordinary Form. The bishop (whom, at 47, every source seems to take delight in pointing out is the second youngest in the US) has sent a letter directing the college to cease all its EF celebrations. Given that a Pope, in Summorum Pontificum explicitly gave the right to priests, not to Bishops, to decide when and where to celebrate the EF, presumably precisely to avoid this sort of thing, it seems clear that in fact Bishop Olson has no right to do what he has done. At least on the surface of things; there may of course be more going on under the surface that we know nothing about. And so indeed suggests 'Tantamergo' [sic], the author of the blog called Veneremurcernui, 'A Blog for Dallas Area Catholics'. Here you can read that Michael King, the Principal of the college, has been adopting a more and more extreme line of late, involving very severe criticism of the hierarchy and of the Second Vatican Council, to the effect that several staff and students have left. This, with other things, has caused a financial crisis which may mean that, despite recent heroic fundraising by the students, the future of the college may be rather brief. But even if this is so, it seems strange to penalise the students if the faculty is at fault. Surely the effect will be to drive students and staff more firmly into the hands of the Society of St Pius X or some more extreme Sedevacantist body. Even if it could be demonstrated that Bishop Olson has the legal right to do what he has done (and I don't think it can), one would certainly doubt the prudence of his action. And most of all we must deplore the lack of charity. The college had sent the new bishop a spiritual bouquet, and rather lamely, he thanks them for their kindness at the end of the letter in which he has dealt them what they must consider the most severe of blows. He tells the college that his actions are for their own spiritual good, which would appear to imply that the use of the EF must be harmful. Presumably the bishop takes the commonly-held line that the EF is a rallying point for all sorts of undesirable things and people; suppress the EF and you get rid of the problem.